A lot of my projects involve 120VAC, switching relatively slowly. Most people use mechanical relays in that situation, but I don’t like them; I try to avoid moving parts whenever possible. 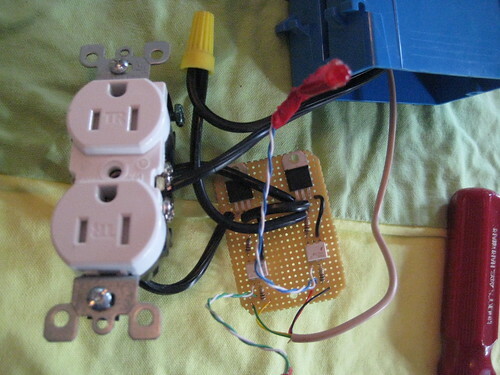 Up to this point, I’ve always used solid state relays. They work really well, but they’re expensive. What this means is that I’ve needed to move my same 2 SSRs from project to project, which is kind of a pain. Well no more! 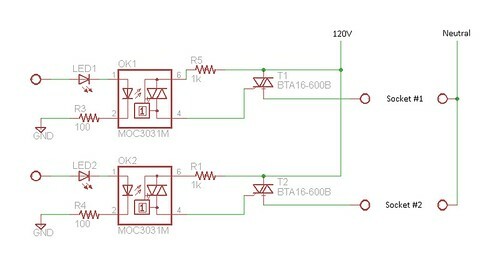 Enter the humble Triac. They’re tiny, cheap, and in my slow switching applications the circuitry isn’t too complicated. That being said, it’s still the most complicated circuit I’ve ever attempted. I figured a good first application would be a switched outlet. It’s fairly simple, and it’s something that I could use in prototyping later on. And there you have it. 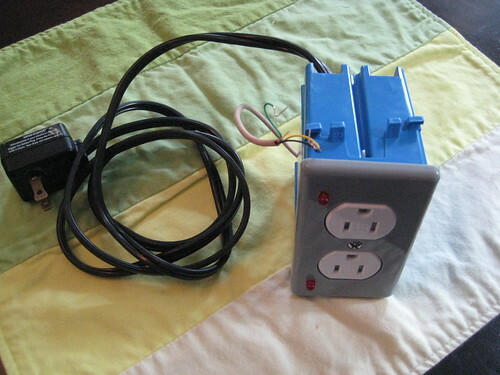 A neat little package with two independently controlled power plugs. The best part is the cost. The whole thing cost less then $10! With SSRs it would have been ~$80, and I don’t know if they even would have fit in the box. Triac Box from br3ttb on Vimeo. Update: There is NOT adequate cooling. I did a real test just now. 1500W toaster oven on high. after a minute I started smelling perfboard. Everything was disconnected before any damage was done, but some design revisions are in order before I try to switch high loads again.